"TV appearances and award wins since brand relaunch. We're riding on the crest of a wave!" At Sprout we are forever excited about the prospect of working with organisations big and small who are at a point of change. When Gary Nutting was introduced to us, he had just set about a new era in the building of his bathroom business - Wave Bathrooms. 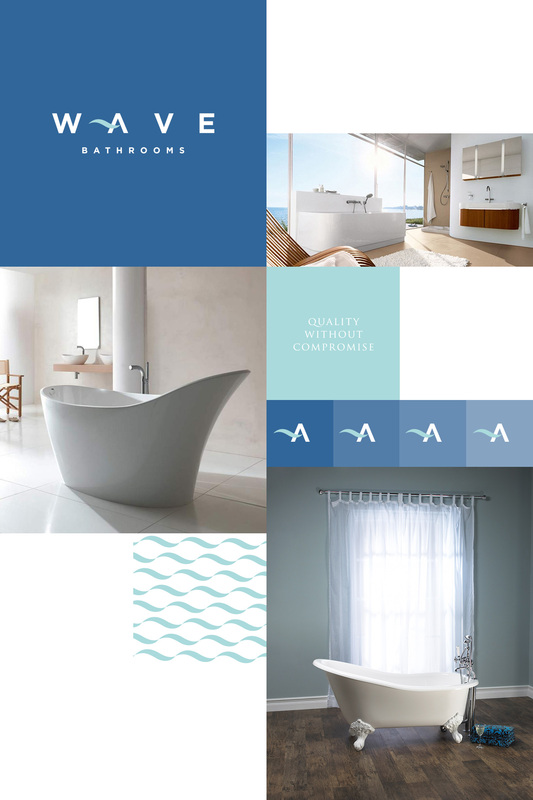 Wave are a prestigious UK based bathroom design showroom specialising in the supply of the best quality products twinned with a fantastic personal design service. Wave obviously needed a brand to reflect the vast knowledge, care and attention to detail offered by the team as well as mirroring the high-end, luxury products available. The resulting identity is simplistic, striking and very positive. Unapologetic in it's boldness, the four uppercase letters are widely spaced to give each character room to breathe - this is a logo that is confident enough to carry this off with aplomb. The flourish that overlaps the 'A' adds an element of dynamism and intrigue to the identity bringing the wordmark to life whilst visually completing the horizontal bar of the letter. This swoosh brings both energy and character to the Wave identity whilst introducing the ownable light blue colour. Twinned with the pure white of the letters and a deep blue background, the palette is established - the blues obviously reflecting the abundance of water, and the clean, crisp white giving a firm nod to the purity of the white products in the room. Since launch the brand has been in significant demand, appearing on Channel 4's Grand Designs programme, working with new high profile contracts and commissions across the UK, as well as winning a prestigious KBB Award for customer service. Wave are certainly on the crest of something big!